Despite some talk that Nokia would be allowed to modify the Windows Phone interface, the Lumia 800 uses a completely unmodified interface. It’s fine with us, but there's nothing to differentiate it from the competition. A push on the unlock button reveals the lock screen, which displays the current time and date and shows calendar events, emails and missed calls. Swiping the lockscreen up unlocks the device and reveals the live-tile Metro user interface. It's a very fluid vertical grid of Live tiles that shows one or two tiles organized in bricked style. Each of these can be reorganized by which ever order you like and you can place almost anything in the grid by holding your finger over it and selecting the Pin to start option. It’s a clean and simple interface. The Live tiles show stuff such as the current date, pending calendar events, missed calls, unread emails and more, all without the need to open up any of the respective applications. You can look at them as homescreen widgets of sorts. But that’s oversimplifying them. In Windows Phone Mango the Live tiles are quicker and offer more info. For example, the Pictures tile shows an animated slideshow of your images. The Group tile (Groups is a Mango-only feature to boot) lists friend updates. The application list has grown a virtual Search button, which makes finding apps easier for those with many apps installed. Here's a demo of the Nokia Lumia 800 in action. 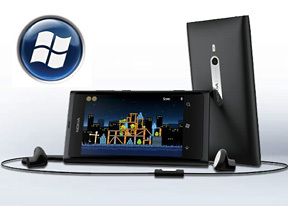 The Lumia 800 comes with 7.5 Mango and one of its advantages over the original version is multitasking. The OS still doesn’t do true multitasking; things are being done the iOS way. Apps not in the foreground are suspended, but the OS has ways to take over and carry out the task for them. To switch between apps you press and hold the Back key (that's right, the Back key, not the Windows key). The app switcher itself looks similar to that of Symbian or WebOS: thumbnail snapshots of the apps, ordered chronologically left to right. You can scroll the list horizontally to select an app and a tap will bring you back to exactly how you left it. Usually, the last 5-6 apps are here. You can't "kill" any of those apps, this is more of a history of the recently used apps. Eventually, as you open more apps, the old ones start to drop out of the list. Once an app is gone, you have to launch it again the old-fashioned way, which has the drawback of starting it over from the beginning. Finally, apps with active background tasks (e.g. streaming online radio) will keep on working. Multitasking can be disabled from the settings to save on battery life. There you'll also find a list of all installed apps that support multitasking. Opening the settings menu reveals two sets of options - system and applications. System covers all the settings you can think of like sounds, color theme, Wi-Fi, Bluetooth, Accounts, etc. The Applications settings enables you to configure individual settings for each app you have installed on the device - the People hub, Phone, Maps and more. Windows Phone 7.5 can be controlled through voice only - you can dictate a text, have the phone read out the reply, you can initiate searches and so on. Other OSes are doing it too (*cough*Android*cough*) but voice commands are a big part of iOS (and a loudly touted one at that), so WP7.5 can brag about it too.